The name 'rough-winged' refers to the tiny serrations on the outermost wing feathers of this swallow, a feature visible only when the bird is in the hand. The possible adaptive significance of these serrations remains a mystery. The Northern Rough-winged Swallow is an aerial forager and feeds over water more than most swallows, sometimes plucking food from the water's surface. This swallow generally does not gather in large flocks like other swallows. It breeds from southern Canada across the United States, and winters in southern most Florida, and throughout Mexico and Central America. The Northern Rough-winged Swallow arrives in Tennessee in late March or early April, and the first individuals depart soon after the young fledge in mid-summer, with most leaving by late September. Description: Adults are uniformly plain brown above, with a white belly, and buffy throat and upper breast. They have square tails and white under-tail coverts. Juveniles are similar in appearance to adults but have reddish-brown wing-bars. Voice: The call is a rough, harsh brrrit. Bank Swallows are smaller and have a distinct dark brown breast-band separating a clean white throat and white lower breast. The tail and overall body shape is more slender. Juvenile Tree Swallows have a brownish-gray back, a dull chest with a faint breast-band, and a whitish throat. Habitat: Breeds in a wide variety of open habitats with potential nesting sites, including banks, gorges, and human-made sites. They are often found near water. Nesting and reproduction: Northern Rough-winged Swallows are cavity nesters and are found in small colonies of a few pairs, or as isolated pairs depending on nest site availability. The male defends a small territory around the entrance of the nest site. Clutch Size: From 4 to 8 eggs, with 5 to 7 eggs most common. Incubation: Female incubates the eggs for 16 days. Nest: In Tennessee natural nest sites include abandoned Belted Kingfisher burrows, crevices in rock bluffs and cave mouths, and tunnels along streams and lakes formed by rotted tree roots. Human-made sites include drain holes in bridges and retaining walls, and crevices in road cuts and quarries. The female builds the loosely constructed nest of weed stems, grass and twigs, and lined with grass. The nest is placed 1.5 to 7 feet from the cavity entrance. 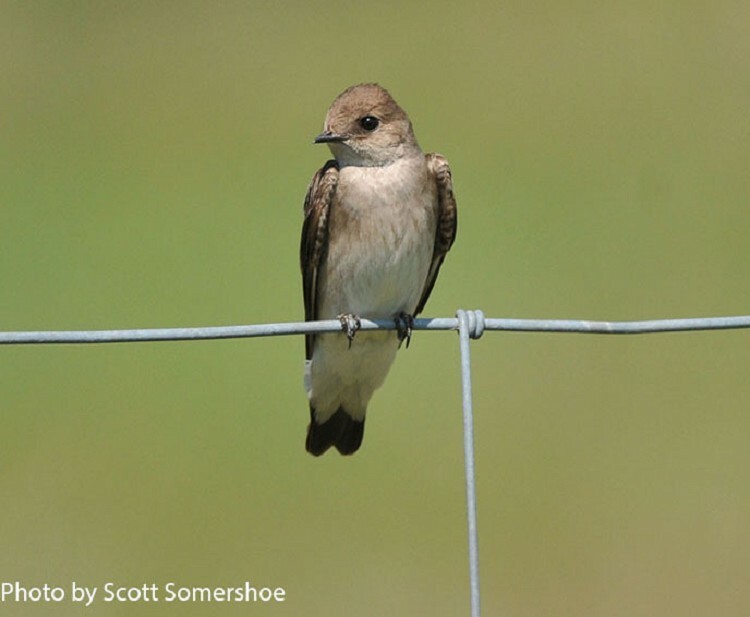 Status in Tennessee: The Northern Rough-winged Swallow is an uncommon summer resident across the state. Its distribution is likely limited by the availability of nest sites. Rangewide numbers appear to be stable. Scientists have been unable to determine the function of the rough wing edge of the Northern Rough-winged Swallow. When John James Audubon discovered the Northern Rough-winged Swallow in 1819 in Louisiana, he originally thought it was a Bank Swallows. It was only later upon closer inspection that he realized he had actually collected a new species. Best places to see in Tennessee: Across the state in areas with potential nesting sites from April through August. De Jong, M.J. 1996. Northern Rough-winged Swallow (Stelgidopteryx serripennis), The Birds of North America (A. Poole and F. Gill, eds.). The Academy of Natural Sciences, Philadelphia, PA, and The American Ornithologists' Union, Washington, D.C.